I've been thinking about which makeup brands really stand out to me lately, and one that always comes up time and time again has got to be Benefit. Although I'm by no means one of those makeup buyers who is 'brand loyal' as such, I always find that Benefit never lets me down, and there are more staples in my makeup bag from Benefit than any other brand. 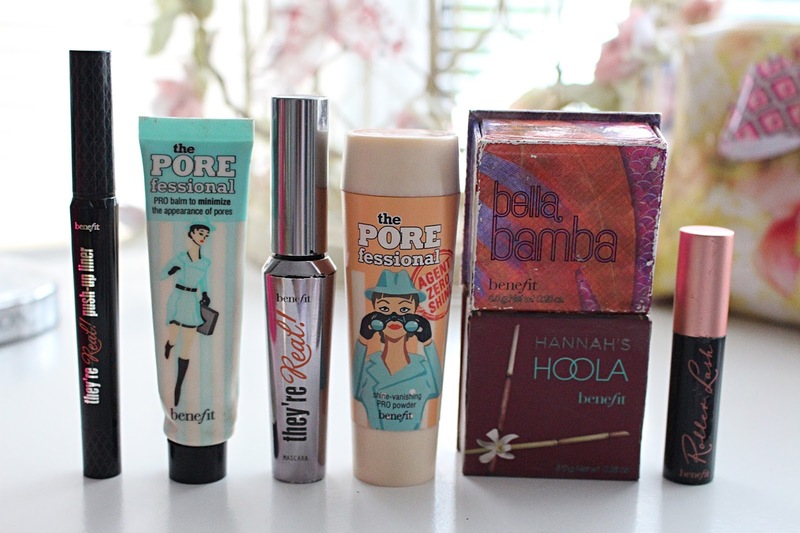 This being the case, I thought it was about time I went through my all-time favourite products from Benefit. Being an eyeliner worshipper for years now, as soon as Benefit released this bad boy I knew I had to try it. A liner that combines the ease of pen-style application with the lasting power of a gel? It doesn't get much better than this. I know there have been a few mixed reviews on this one but I absolutely love it, and think anyone with an addiction to eyeliner needs this in their makeup bag. The staying power is immense and the liner itself lasts months and months before you use it up - trust me, I use it every day! A long-time favourite of mine, Porefessional is an incredible primer that always ensures my makeup stays in place, my pores are minimised and my skin matte. It works amazingly well with my go-to foundation, Estee Lauder Double Wear, and whilst it's not the cheapest it's the best primer I've tried. I'm not the biggest mascara fan, as I can never find a mascara that compares to falsies, but this is a very close second to them. It's probably the best mascara I've ever tried in terms of volume, curl and length. It's a bit of a pain to get off but if you've been on the hunt for a 'wow' mascara for a while now, this one is definitely worth a try. Whilst I'm not the biggest fan of the packaging (I find it a bit of a faff trying to get the powder out of the small top) I do really like this powder. I'm a bit fan of loose powders and the fact this has a slight tint saves your skin from getting that 'ghost' effect. It is super soft and works really well with the original Porefessional to keep skin matte. The cute little brush it comes with is handy too. I'm a bit gutted that Benefit seem to have discontinued this blush because it's my favourite of theirs! It's a gorgeous watermelon shimmery pink (it smells amazing too) and is perfect for summer. I really hope they rethink getting rid of it but it looks as though Rockateur (a muted down pink with gold) has replaced it. Booo! The perfect matte bronzer, Hoola has been a staple in my daily makeup bag since I discovered it ages ago. I love how matte this is but I have fallen a bit out of love with it lately - it just doesn't quite stand up to my NARS Laguna, unfortunately. It's a bit too dark for paler complexions but is fab for contouring. The newest addition to my Benefit collection, the new Roller Lash mascara is a really good mascara - for lengthening, not so much curl. I find this lengthens my lashes amazingly but doesn't do much in the way of curl - which is odd, considering that's it's main selling point! I've been reaching for this over my beloved They're Real lately though, so that definitely says something. I find it's really good for doing my lower lashes too. What are your favourite products from Benefit? Let me know!